Grandma and Cedric Adams – believe it or not! 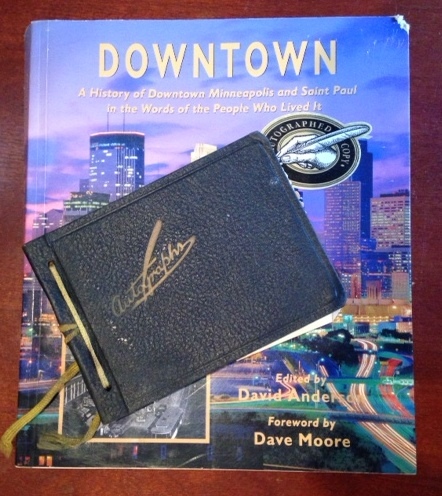 Downtown, a book about Minneapolis, and Grammer’s autograph book, provide clues to the mystery of my grandmother’s relationship with Cedric Adams, the Twin Cities radio announcer. 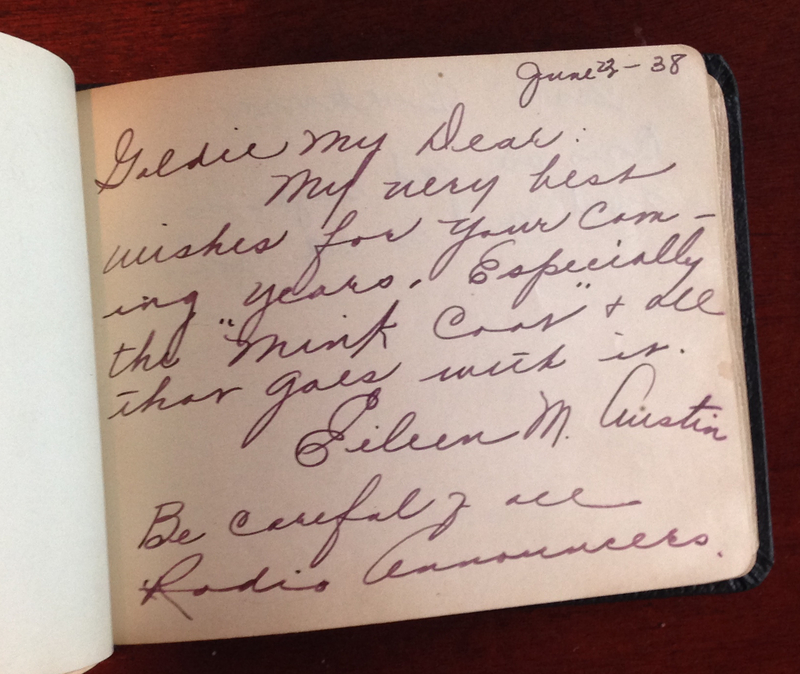 It all started with a tale told by my late Cousin Pat, a book about the history of Minneapolis, and a peculiar warning in Grammer’s autograph book. “Grammer,” as my grandmother was called, was the epitome of what a grandmother should be – doting, kind, and indulgent. Okay, my mom probably didn’t appreciate the fact she spoiled me with candy and cookies, and showed me my Christmas gifts early, but I adored my grandmother. As I grew older, Grammer would share with me stories from her childhood. Later, as I became a genealogy addict, she was always interested in learning about my latest findings. After returning from a research trip in Grammer’s hometown of Minneapolis, I loaned her a book I’d purchased called “Downtown.” Little did I know I wouldn’t receive it back until Grammer had passed – but she would never tell me why or what happened to it! A biography of Cedric Adams and an article written by him appear in this book that my grandmother didn’t want to give back to me. 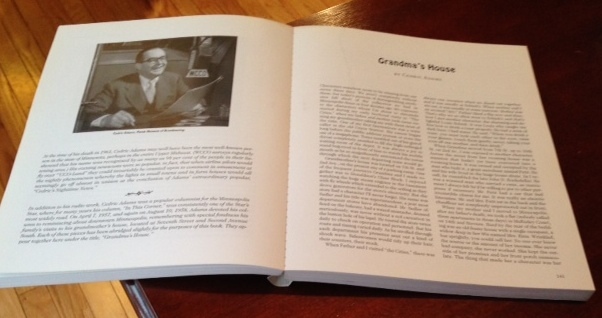 Right after my grandmother’s death, I became reacquainted Grammer’s niece (my mother’s cousin), Pat (Anhorn) Blair. Cousin Pat told me of my grandmother’s wild teenage years, and I learned a side of Grammer that I’d never known before. The most interesting detail, however, was regarding Cedric Adams, an overwhelmingly popular radio announcer in the Minneapolis/St. Paul area in the 1930s and 1940s. My very best wishes for your coming years. Especially the ‘mink coat’ & all that goes with it. Be careful of all Radio Announcers. While I still find it very difficult to believe this married man was dating a sixteen year old girl, one thing is clear: my grandmother, the little old lady who fed me cookies and milk after school, helped me with my homework, and gave me a pony, wasn’t always old. Just like others her age, she had dreams and hopes, and yes, crushes. Cedric Adams must have been a really special guy to have captured her heart. This entry was posted on Sunday, February 9th, 2014 at 4:44 PM	and posted in My Family Lines. You can follow any responses to this entry through the RSS 2.0 feed. « If only I woulda…..